Aubrey Roberts leads a pack of runners. The junior will make her third appearance at NCAA Championships next weekend. 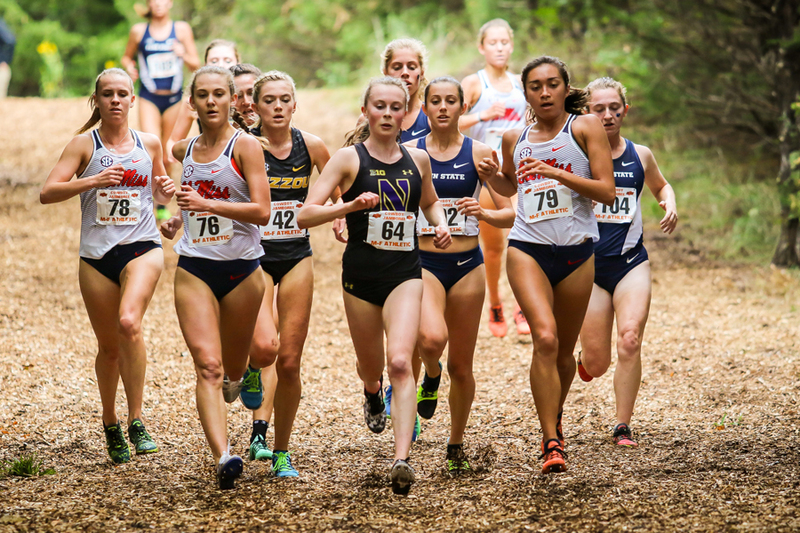 At this weekend’s NCAA Midwest Regionals — a meet that marked either the end of Northwestern’s season or the team’s first appearance at NCAA Championships in program history — the Wildcats fell short. NU finished fifth overall in team standings with 205 points, trailing fourth-place Illinois by two points and third-place Minnesota by 20. Coming into the race, the Cats hoped to run competitively against the No. 23 Golden Gophers and challenge No. 15 Iowa State and No. 26 Oklahoma State for automatic bids to NCAAs. Though falling short, the team’s fifth place finish along the Illinois River was the program’s best in six years. Northwestern was led, as usual, by junior Aubrey Roberts, who crossed the line in 20:24 to land her third consecutive fourth-place finish at the meet. Behind Roberts, fellow junior Sarah Nicholson took 21st individually, finishing in 21:09 and landing All-Regional honors. Freshman Sielle Kearney placed 42nd with a time of 21:28 — a personal best — followed closely by senior Isabel Seidel and freshman Rachel McCardell, who crossed the line in 65th and 73rd, respectively. Next weekend, Roberts will travel to Madison for the NCAA Championships to compete on the Badgers’ Thomas Zimmer Championship Course — the third time this season alone she’s run the 6K loop. During her freshman campaign, Roberts became the first runner to qualify for NCAAs from the program since Audrey Huth did so in 2010. Last season, Roberts placed 63rd out of 255 runners at NCAAs with a time of 20:26. This year, the team’s perennial powerhouse will likely look to break the top-40 — and qualify as an All-American.